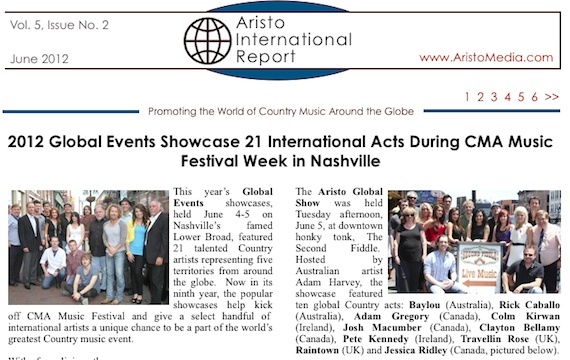 • A recap and photo gallery of the successful 2012 Global Events showcases, held each year at the beginning of CMA Music Festival week in Nashville. • A Q&A with Americana Music Association Executive Director Jed Hilly, who discusses the rising popularity of the genre in the U.S. and abroad. • The upcoming Canadian CMA Awards, to be held this year in Saskatoon, Saskatchewan. • A profile of “Big Daddy” Lance James, who has been waving the Country music flag in South Africa for more than 50 years. • A look at Lady Antebellum’s Own The Night world tour, which is selling out in Australia. • Info on Aderra Media Works and its innovative, custom USB drives. • Photos, international festival news and more.